It has been about a year since photographer and Memphis College of Art professor Haley Morris-Cafiero's work went viral. On February 7, 2013, an article about Morris-Cafiero's photography and accompanying images appeared on The Huffington Post under the headline "Haley Morris-Cafiero, Photographer, Explores Fat Stigma in 'Wait Watchers' Series." Morris-Cafiero's photos and her story were rapidly picked up, rephrased, and shopped around the web, garnering shares and comments on salon.com, nydailynews.com, and dailymail.co.uk, among others. The Internet-famous photography series is on display at the Dixon Gallery & Gardens through March 30th. This is the first time the work has been shown in a museum. 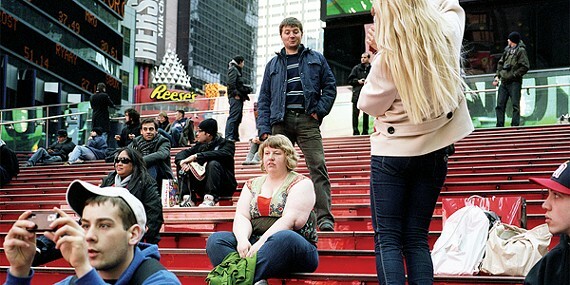 Distanced from the blaring headlines that defined Morris-Cafiero's work for a year (a sample Google search of the photographer's name and the phrase "fat shaming" returns 12,200 results), the photographs have the opportunity to be seen in the context for which they were originally intended: as fine art. 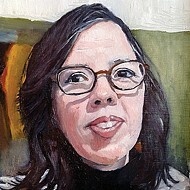 "Wait Watchers" is a series of self-portraits that feature Morris-Cafiero as a tourist on the streets of foreign cities. The photos capture not only Morris-Cafiero, who poses as anxious and somewhat lost, but the mocking expressions of passersby, who (it would seem) disapprove of Morris-Cafiero's appearance. Morris-Cafiero shoots digitally, but the works are stylistically reminiscent of traditional film photography. In some, Morris-Cafiero poses in ways that recall romantic travel cliches: She wades in the ocean or stands in the yellow light of a pastry counter. 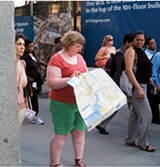 In others, she is the consummate tourist, center-stage and encumbered by a map or camera. Morris-Cafiero says that the project arose incidentally, while she was shooting another series. A self-portrait she snapped of herself in Times Square happened to capture the condescending smirk of a man a couple feet behind her. The photograph also frames the back of a blonde woman, who is photographing the smirker, and another young man, who poses for an iPhone selfie. What began as a simple self-portrait emerged as a multi-perspectival Gordian Knot of a photo. Morris-Cafiero's photography takes a swing at the traditional setup for portrait photography. In the typical portrait, there are three presences: the subject of the photo, the photographer, and the viewer. The photos in "Wait Watchers" shake up the traditional power dynamics of the photograph — subjects are voyeurs, and voyeurs are subjects, including you, the viewer. The work presents "judgment"' and "perspective" not only as central to its subject matter, but as a formal concern of the photograph. The Dixon exhibits "Wait Watchers" in simple white frames. The prints are relatively small and evenly spaced throughout a hallway gallery. There is nothing dramatic or radical about how the works are shown, nor does the explanatory material hint that Morris-Cafiero's work recently partook in a weight-centric Internet firestorm. The works are, nonetheless, radical, and more so in a museum than in the limelight of the Internet. If you look up Morris-Cafiero's work on beautifuldecay.com, you can read an article that touts the photographer as a heroic voice against fat-shaming, and then you can scroll down to an ad for "5 foods you should never eat again," complete with a picture of a woman squeezing her stomach. On The Huffington Post, the article about Morris-Cafiero's work is bisected by an advertisement of a thin woman smiling and eating a salad. It is still a radical act for a woman, particularly an overweight woman, to turn the camera on herself. Those who see "Wait Watchers" in person are offered an experience of Morris-Cafiero's work that is not encumbered by the advertising imagery, comment wars, and sensational Internet headlining. In its display at the Dixon, the subtlety of Morris-Cafiero's craft and concerns can really shine.